Oxford TEFL Barcelona is moving to new premises, which has given us a chance to think about classroom management, and the environment and resources we want the school to have, within the restrictions of space and budget. And there have been some lively discussions (in other words disagreements), which are as much about methodology and beliefs about learning languages as they are about the colour of the walls. Let’s start with the classrooms themselves. 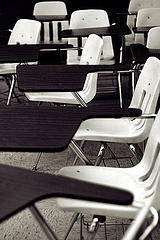 What furniture is best for students and teachers in language classrooms? Classic seats with arm rests? Tables and chairs? Round, square or rectangular? One big table? Sofas and coffee tables? Bar stools around a high table? What about the technology? Regular Whiteboard? Smartboard? Computer with projector and screen? On the same wall as the whiteboard or a different one? Or no technology, just a couple of plants…? These aren’t just questions about design, branding or Feng Shui. If you have a group of learners with a teacher, what is the best place for them to spend three hours a week together and what does your answer to that question tell you about your beliefs about learning languages? 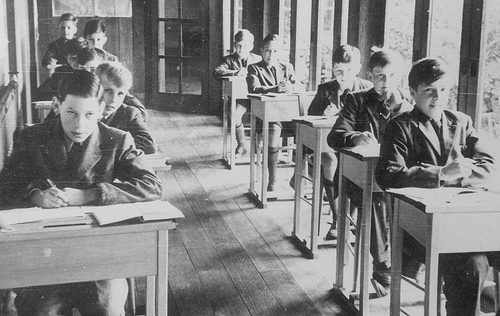 In olden times everywhere and still in most classrooms around the world today, especially at secondary level, children sat or sit in rows behind desks facing the teacher and a board. This arrangement says, “sit quietly and pay attention to the teacher or the board, don’t talk to each other”. With the advent of the communicative approach in language teaching in the 1970s, and in the context of adult teaching of smaller groups, the desk-chair (a seat with a small table attached) became popular. This was easier to move and allowed students to work in different pairings and groupings easily. Two downsides of this: first, the chairs are often set in a U shape, so that although students can see each other better the focus is still on the teacher and the board. Second, students complain that it is difficult to write and their books fall off. With an increase in interest in exam preparation classes such as the Cambridge FCE, this is a serious setback. A third option is students sitting in groups around desks (as happens in many primary schools). This is my personal favourite as it matches my belief that classes work better with the students focused on themselves and each other and the teacher predominantly in a monitoring, supporting role. This is the arrangement that best aligns with communicative methodology. On the downside it can feel weird when groups go smaller than 8 and there can be resistance from students and teachers. Maybe they think they the teacher needs to be seen and heard more. She’s the one getting paid! A language classroom is basically a place which hosts a social event. If you think of your classroom as a group of friends in a pub, then it is natural for them to gather around a teacher if there are 4 of them, but gather around each other in clusters or pairs if there are more than about 8. In a one to one class it seems natural to sit with your student and write on paper, not stand at a whiteboard. This is a term which refers to the effect that position and space has on communication and the way we feel. To experiment with this next time you are having a conversation with someone try out some different placings (standing, sitting, face on, side by side, etc) and notice how things change. We learn languages principally by practicing having conversations, so I think psychogeography will have a considerable impact on how successful classroom teaching and learning is. What do you think is the best layout for a classroom? Have you experienced particularly good or bad classrooms as a teacher or student? What do your students like when it comes to this aspect of classroom management? Duncan Foord, director of teaching at Oxford TEFL, argues that discussions about the classroom environment are as much about methodology and beliefs about learning languages as they are about the colour of the walls. This entry was posted in Tips and tagged classroom management by Fran Austin. Bookmark the permalink.